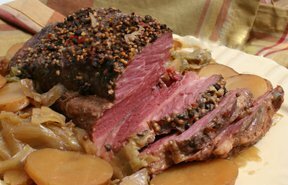 A corned beef and cabbage recipe perfect for celebrating St. Patrick's Day. The lengthy slow cooking time of this dish, transforms a simple beef brisket and plain head of cabbage into a fantastic one-pot meal. This slow cooking whole meal recipe is sure to be a favorite of any Irish food lover. Learn an easy method for cutting and coring cabbage for your favorite cabbage dish this St. Patrick's Day. Learn a little about corned beef, how it is made and how it is served.